DON'T MISS YOUR CHANCE TO PARTICIPATE IN THE PREMIER FUTSAL LEAGUE IN WICHITA. Divisions: Gold, Silver or Bronze (if possible). Futsal Wichita will use the United States Soccer calendar year age matrix for all events. Futsal Wichita will use the state-of-the-art Wichita Hoops Premier Athletic Facility located in Bel Aire, Kansas. Futsal Wichita is the only US Soccer sanctioned futsal league in Wichita. We only utilize US Soccer futsal - certified officials to call our games, assuring the game is played the way it should. In addition, Futsal Wichita is the only Wichita league that uses 2 experienced officials for ALL age groups. Futsal Wichita Winter league is kicking off its third season and looking at having a very strong number of teams participate. Check out the Interested/Registered teams page for updates. Boys/Girls U8-HS. This year we will offer competitive and recreational divisions (if possible) for more even competition. Futsal Wichita reserves the right to drop or combine divisions or age groups. Registration will open on August 1st. Games begin on November 29th and will run through February. High school girls will finish league play before the KSHSAA mandated date. Futsal Wichita plays its games on Thursdays and Fridays. Teams will be scheduled to play a minimum of 10 games. When you register your teams, you will be allowed 4 conflicts. If you plan on participating in the Central or Midwest Regional Futsal Tournament, please indicate that in the conflict section of your registration. Games will not be played on 12/27-12/28. There is no coaching license to coach a team. Any adult who is registered with the team as a coach or manager can sit the bench. This is a great option for teams with outdoor coaches who want to take a break, but still want their teams to have fun and play. ALL Coaches MUST submit a background check in order to coach in a USYF sanctioned event. Background checks are $11. Futsal Wichita will accommodate coaches with multiple teams by scheduling them with back-to-back games as much as possible. This should not be an issue, so we encourage you to split your outdoor teams into two futsal teams. Before each game, a pre-printed game card will be available from the referees. The cards will be populated with player names and numbers. Please check the cards for accuracy and then hand them back to the referees before the game begins. At the end of each game, the referee will hand the bench coaches the completed game cards. The coaches are to sign the cards and in doing so, verify the score. The scores on the signed cards are official and will be entered into the standings. Official futsal FIFA Rules and Regulations as stated under the Laws of The Game will be enforced. Exceptions are noted below under House Rules. You may print up a copy of the Laws of the Game at the Futsal Wichita website. Goalkeeper can not drop kick or punt the ball. Split outdoor teams will get an additional $25 off per team. All players must be registered with USYF and releases signed by player/parent/guardian (P/P/G). The fee is $13.50 per player and is completed on line only. When the team manager inputs a player into the roster, an e-mail is sent to P/P/G with instructions as to how to complete player registration. There is no fee for managers, coaches, or assistant coaches, unless they are also players. Futsal Wichita will institute the issuance of player cards. To be eligible to play, each player must have a card. Player cards are issued only after full payment of fees, signed Medical / Media Release forms have been received and all players have been registered online. Futsal Wichita will conduct a team check-in one - two weeks before league play begins to issue player cards. Players do not need to be present. Check-in time and place will be announced. 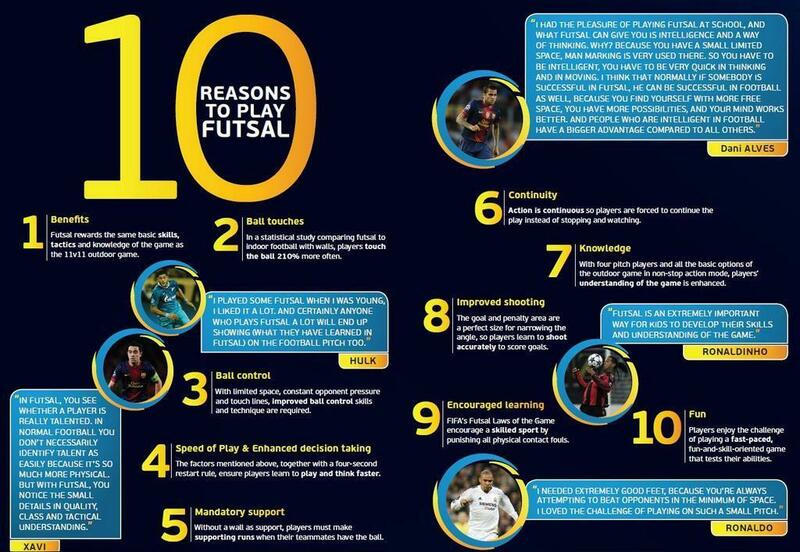 1) A sister team is created from an outdoor team that split into two or more futsal teams. If you have a sister team in the league, you may borrow any amount of players from the sister team. 2) Players may be double - rostered on non-sister teams with knowledge and permission from both coaches. Player cards and rosters may be checked before games. This is to assure that all players are registered and the league remains sanctioned by US Soccer. Team managers are to carry the game cards with them for inspection before games. Under U12 - size 3 or a Select "Jinga Jr"
U13 and older – size 4 or a Select "Jinga"
To order balls e-mail Justin Jarman at justin@wichitahoops.com for more information. The wearing of shin pads will be mandatory for all players. Indoor, flat soled soccer shoes also must be worn. If the referee terminates a match for reasons other than an act of God or field conditions, the Futsal Wichita Competition Committee will decide the result of the match after hearing the official reason from the referee, and both coaches. There are no awards given for winners of divisions. If a player is ejected from a match, the player’s pass together with a referee’s report of the incident shall be turned over to the Futsal Wichita administrator by the referee. The maximum penalty, after review by the Futsal Wichita Competition Committee, may result in the individual players or teams’ expulsion from the competition. If a player is ejected from a match the referee will hold onto the player pass, document red card on the back of the score sheet and present it to the Futsal Wichita League administrator. The player will have his/her pass returned after a one game suspension. If a coach is ejected from any match, a referee’s report of the incident shall be turned over to the Futsal Wichita administrator by the referee. The maximum penalty, after review by Futsal Wichita Competition Committee, may result in the individual coach or team’s expulsion from the League. If an opponent cancels a game or does not show for the game, the other team may use the scheduled game time for their use. There are no refunds for games cancelled by opponents. If a team must cancel, call Futsal Wichita as soon as possible so we can notify the referees and give the other team a chance to plan accordingly. Cancelling a game not only short-changes your team, but your scheduled opponent. Games cancelled by teams will not be rescheduled until the $100 reschedule fee is paid to Futsal Wichita. At time of registration, each team is allowed multiple conflicts if entered into registration system before registration deadline. If manager does not enter conflicts, no reschedules will be made unless a $100 rescheduling fee is received by Futsal Wichita. Futsal Wichita will schedule 10 games for each team. We can only reschedule games if the facility has available times to reschedule them. If we reschedule games due to above, you will not be asked ahead of the rescheduling process if you are available for the make up game. Your team will be given a makeup game time and if you cannot make that, we will not reschedule. We reserve the right to postpone or cancel games at any time for any reason such as bad weather or facility problems. Futsal Wichita plays games in all weather and only cancels games if the facility cancels. Cancellations are very rare events, so teams should plan on playing. If there are games cancelled, reschedules are not guaranteed and refunds for cancelled games will not be provided. If you have an interest in joining the Futsal Wichita referee pool, please email Justin Jarman at justin@wichitahoops.com. To be eligible for consideration, you must be licensed with US Soccer as an outdoor referee and be at least 15 years old.